The last few days, I've been trying to shoot a specific photo. More to the point, I have been trying to re-create a photo that I shot a couple of years ago but that was inadvertently destroyed. I can see that image clearly in my mind and know exactly where I shot it. I've gone back to the same spot several times only to come away with images that are bland and uninteresting and don't live up to my memory of that image from the past. However, walking to and from the site of my earlier photo, I've shot several other photos that I really like - images that have life and interest. While this may be an experience specific to my efforts to exactly re-create an image, I suspect it is something we all struggle with in a way. We are urged to see in our minds what we want to capture in the camera. Ansel Adams declared that, "Visualization is the most important thing in photography." And a quick search on Google reveals page after page of web posts about the importance of previsualization. Now I hesitate to argue publicly with Ansel Adams, but it seems to me that attempting to create the exact image we see in our minds can become a trap. My experience this week is evidence. With that specific image in my mind, nothing I've been able to shoot lives up to it. At the same time, I turn around to head home, see something that I didn't expect, and am able to make a satisfying photograph. I understand that Adams was also talking about the technical end of creating photographs, and the necessity of seeing the finished image in order to make the correct decisions about exposure, development time, and so forth. But even Adams admitted that previsualization didn’t always work. Describing how he made Moonrise, Hernandez, New Mexico, in his book Examples: the Making of Forty Photographs, he writes, “I had been photographing in the Chama Valley, north of Santa Fe. I made a few passable negatives that day and had several exasperating trials with subjects that would not bend to visualization.” And then, driving back to Santa Fe, he saw the unexpected, the unplanned – the moon rising over the small town of Hernandez. We’ve all had both sides of that experiences, I think; the frustration when we are trying too hard to make the work go right, and the nearly mystical gift of an image when we aren’t trying at all. What are the ingredients of those mystical moments, and how can we cultivate them? 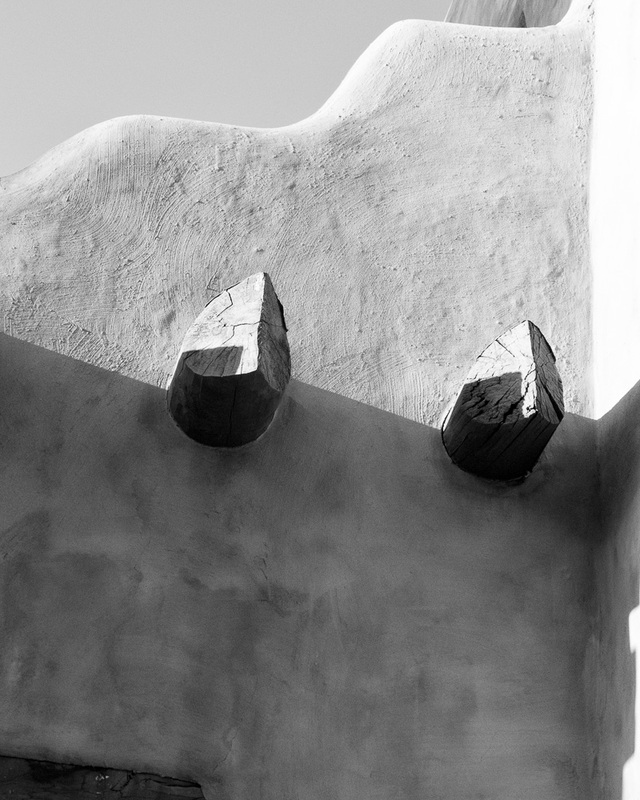 A day I spent in Santa Fe a couple of years ago stands out to me as one of those lovely photographic experiences. I had nothing in mind, and would probably have been just as happy if I came home without having taken a shot. But I am an inveterate wanderer, and nothing is a better excuse to wander and look than having a free day and a camera in hand. There is pleasure in simply seeing the world, letting it flow in front of me in whatever way it wants. That's how "LOVED" came about. It was a chilly March morning, as I recall, and I was ready for a warm cup of tea in one of the cafés along Canyon Road, when something in a little courtyard caught my eye. Next to a trashcan and an anonymous door, partly hidden behind a patch of weeds, a discarded sign declared, "Loved." I shot a frame, then came in closer and shot another. The odd juxtaposition made me wonder; what was loved? Who was loved? And why was love thrown away? The moment was over quickly and I continued my search for a place to warm up. But the image stayed with me. When I set out with a goal in mind to make a specific photograph, I more than likely come back empty-handed. When I simply wander around, images present themselves in ways that I would've never planned or anticipated. What makes the difference? I think it is this. Having a goal puts us on a path that only leads to one place. Any deviation from that path is a distraction and interesting things that the world gives to that don't fit the path to the goal are dismissed or discarded. When we attempt to take control of a fluid process and bend it in a certain direction, we risk losing the possibilities of spontaneity, or surprise. Trying harder only raises that risk. After warming up in a little café, I continued my walk in Santa Fe. In a completely nondescript parking lot, one I would usually pass by without a second thought, I saw the shadows of an overhanging tree against an adobe wall. 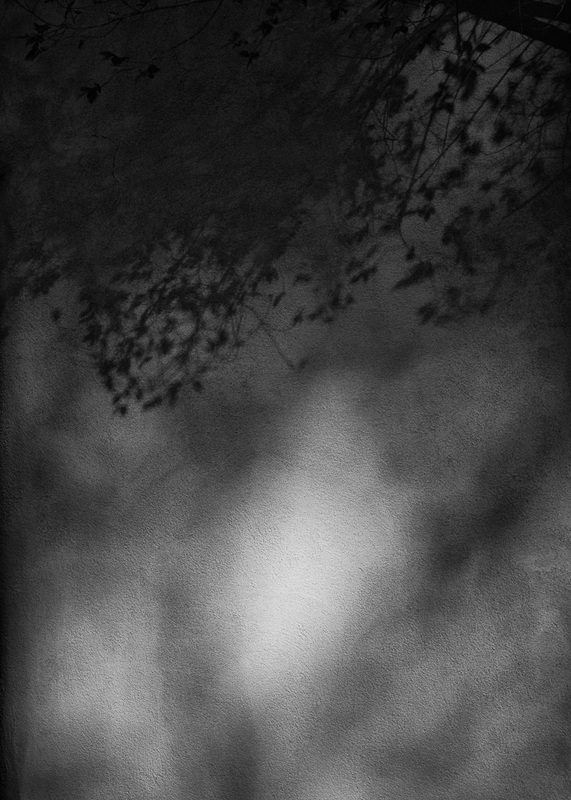 I made another image, and then a couple more, trying to capture the subtlety of light and shadow and texture. There is something quite beautiful, and elemental, about sunlight on adobe. If goals get in our way, then, what is it that leads us through experiences like my morning in Santa Fe? I'd like to propose that the alternative to having a goal is bringing intention to our work. What's the difference? Where goals lead us to search for a specific end, intentions set us on a path whose end is unpredictable and which we likely never reach. Intention allows for detours, distractions, and the meandering that can lead us to the fresh and unexpected. Even if that effort proves a dead end, there need be no failure or frustration. The path continues. There is another level to this distinction, something more subtle. Goals invite us to impose our will on the world and make something happen. The effort to create then becomes a battle between what is and what we want to be. Intentions, on the other hand, can lead us to a state of allowing. The battle doesn't have to be joined. We simply have to be open to what is in front of us. Goals threaten to take away our ability to be present; intention ushers us into the present moment. As my day in Santa Fe continued, I found myself downtown near the museums and the Palace of the Governors. Despite the magnificent mountains to the east and the wide-open sky to the west – a vista that certainly could have made a beautiful image - I found myself intrigued with the details of the buildings. The ends of the wooden vigas in the bright sunlight against the shadows on the adjoining adobe caught my eye. The harsh light, rough wood, and shadows created a nearly abstract pattern. Another image. So what is the intention we bring to photography when we have entered the flow and it is going well? It is tempting to first think of it in photographic terms. Do we bring the intention to find the best light? Do we bring the intention to experiment with the visual frame? The best intention we can bring to our photographic work is more fundamental. I think it is simply the intention to be present. This is not an easy, or passive, task. In their book, Art and Fear, David Bayles and Ted Orlando talk about how much making art is about dealing with fear. "Fears arise when you look back, and they arise when you look ahead." Undealt with, our fears lift us out of the present. But what do we have to fear is photographers? After all, we simply walk around snapping pictures and no one needs to see any failures. It is a largely solitary affair. But there are indeed fears. We know the failures. We wonder if we are being good enough, if our images are strong enough, if we will ever reach the level of our art that we aspire to. All of these things take us out of contact with the visual world before us. And it is our fears, I think, that make goals so tempting. Goals suggest we can predict the outcome, that we don't have to take chances, that we can't be thrown off the path. Late in the afternoon, when the sun began to sink into the Southwest, creating the almost palpable afternoon light of Santa Fe, I was walking down the side street away from the Plaza when another beautiful detail stood out for me. The sign for a restaurant and a nearby utility pole created a powerful shadow, again on an adobe wall. I don’t believe it is an image I could have searched for. It was an image that had to be found, an image I had to be present for. In addition to being present to the world, as photographers we need to have the intention to interact with that world, at least visually. I sometimes think that making photographs is like a dance between what’s in the world, what I know that the materials of photography can do, and all of the experience and knowledge I bring to that specific situation at that specific time. Good photographs can’t be made, in my view at least, from emotional distance. We need to be present, not in some abstract way, but in a getting your eyeballs dirty way. We need to both see the world and move into it, taking a chance. That evening, as I headed back to where I was staying, I passed a house with a white picket fence. The gate was open slightly and caught the evening light perfectly. It immediately made me think of Paul Strand's white picket fence image from so many years ago. But it also seemed to reflect what my experience had been that day. Intentions leave the gate open, leave us with a path to follow forever if we choose, and help us bring a presence to our art that can get lost too easily when we rigidly set out to make a certain thing. Perhaps that is the best intention of all, to leave the gate open as best we can.